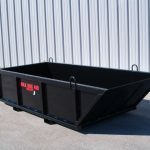 The Max Box 410 is a manual dump box / Skip Pan used to lift, sand, gravel, dirt, roof debris or any other job site materials. Rated load capacity 4,000 lbs. Dimensions: 52” x 10′ 2″ x 26” high (outside). Built in compliance with ASME B-30-20 under the hook. The Max Box 410 is load tested, certified and tagged. Empty weight of 890 lbs.